Bamber House is a beautiful colonial lodge situated in the peaceful and leafy suburb of Mt Eden, Auckland, just a short bus ride or a 30 minute walk into town. We also offer all our guests FREE AND UNLIMITED WIFI! We are perfectly located if you want to mix it with the locals with a good choice of popular cafes, bars and shops and a large supermarket just a short walk away. 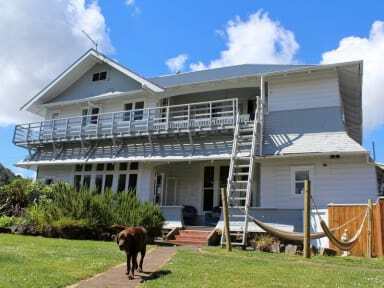 We are ideal for those travellers searching for the chilled out New Zealand experience away from the big city but close enough to enjoy the town's attractions when it suits. Car parking in the city can be really expensive so our free off street car parking is a big advantage if you have a car. If you want to be right downtown this is not the place for you. We have beautiful parks and Mt Eden itself on our doorstep affording panoramic views of the entire city and providing excellent opportunities to enjoy the outdoors. Our friendly hostel has a choice of dorms and private rooms in addition to clean and spacious communal areas, a log fire and a beautiful big garden. We can accommodate guests from the age of 10 upwards although only those aged 18 and over can be booked into our share rooms. Our experienced staff are at hand to offer the best advice on travel itineraries around New Zealand and can book you onto any activities and excursions at short notice as well as arranging hire cars at great rates. We regularly provide activities within the hostel to keep you entertained and ensure you have every opportunity to meet your fellow travellers. We offer a range of activities in our comfortable lounge area and frequently arrange trips into the city to try out a few bars and clubs, ten pin bowling or catching the latest blockbuster at the cinema. We also have all the usual board games and a book exchange. i actually didn't come but i booked and paied diposit, anyway i give a full score regardless i didn't come, hope next time i'll come.